Brand: Sweet Sugarbelle ACF-378975 Units: 1 set/ 6 pcs. total Use to paint on icing with colors that are ready to use. Set includes three paint palettes and three food-safe brushes. Each palette has 6 different colors. To use: Wet brush with water and brush over palette to pick up color, just like watercolor paints. Use to paint on icing with colors that are ready to use. 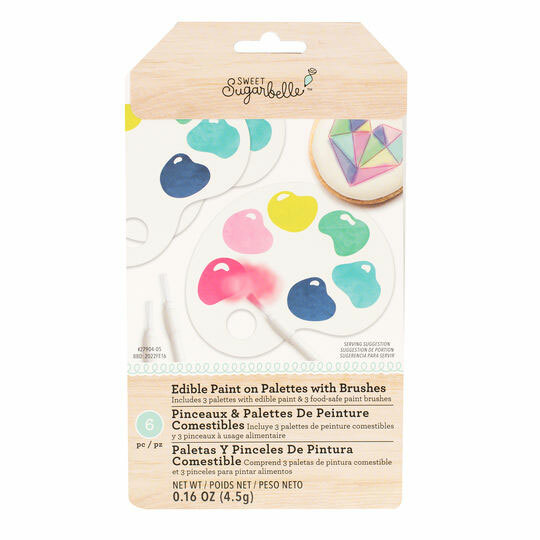 Set includes three paint palettes and three food-safe brushes. Each palette has 6 different colors. To use: Wet brush with water and brush over palette to pick up color, just like watercolor paints.